The General Electric Fuji Electric 6KG1143030X1B1 is a 30 horsepower drive that is a member of the AF-300 G11 drive series. 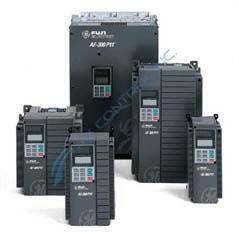 A 3 phase variable frequency inverter, the drive can input 460 volts with a frequency of 50/60Hz. It can output between 380-460 volts with a frequency range of 0.1-400 Hz and it has a rated output current of 45 Amps. A mounted factory installed keyboard panel is on the front plate of the drive. Encased in a NEMA 1/ UL Type 1 enclosure, the dimensions of the driver measure 15.75in (H) x 9.84in (W) x 7.68 in (D) and weigh 23.1 pounds. Two mounting screws found on the front of the drive can be loosened to easily remove the front face plate. After removing the front plate, the factory installed keyboard panel is accessible for removal as well. It is important to follow all storage requirements when using 6KG1143030X1B1. Improper storage in unsafe temperatures and humidities can result in drive damages, accidents, or fires. Insulation around the drive is important to keep out moisture and condensation, which could cause the capacitors to corrode. The operating facility should maintain a temperature between -10℃ to 50℃, or 14℉ to 122℉. If the ambient temperature of the operating facility is higher than 40℃, or 104℉, then the ventilation covers should be removed to prevent damage to the device. When installing the drive, be sure to follow all safety precautions to avoid accidents or fires. The drive and heat sink must be installed in an area free of debris as the heat sink can reach temperatures of 90℃, or 194℉. Be sure to refer to the instruction manual found on the nameplate for safe installation.